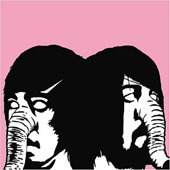 Death From Above 1979 is a very metal band name but is, in fact, a two-some that makes chaotic brand of garage rock in the vein of The Moonie Suzuki, The White Stripes and The Strokes. A pair of Canadians on bass and drums (the drummer sings as well), Death From Above 1979 make a whole lot of noise on their album, You’re A Woman, I’m A Machine. That noise is poorly produced, and something that appears to be an intentional attempt at getting a late 70’s rock/punk sound. The spastic drum lines are perfect for the new wave of hipster clubs filled with white people dancing while wearing too-tight overpriced ‘vintage’ clothes. These are the kind of people that claimed that pink was manly and that distortion is automatically art. In both cases, they are wrong. The music begins to grate early, and does not let up throughout. The migraine-inducing songs are about the usual girlfriend drama and are not nearly as sexual as their titles would indicate. If you own a tee shirt that has ‘Carter Knows Potatoes’ and cost a hundred bucks or more, you probably would fall for this album and keep it in regular rotation. If you don’t, then you would have stopped playing the record at the initial feedback at the top and would not have missed a thing.